Home / Mutual Fund / Why SIP is Better Than Traditional Investments like Fixed Deposits Or Recurring Deposits? Why SIP is Better Than Traditional Investments like Fixed Deposits Or Recurring Deposits? Hello friends, wish you all and your family a very very happy new year. I hope this year will fill your life with happiness and wealth. Make sure to take care of your health, that's something more important than anything else in this world. 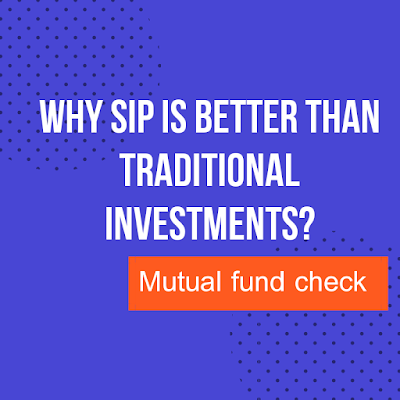 So friends this year first post will be related to the reasons why SIP are a better option than traditional investments like fixed deposits, recurring deposits, national saving certificates or any kind of term deposits plan. Let's start. SIP is acronym of systematic installment purchase. It is nothing but a kind of indirect investment in a stock market with a pre-defined order which is given on a specific date and time each month. SIP is better than direct investment in the stock market because of few genuine reasons. First, it invests your money in a portfolio of stocks which reduces your risk. Second, this portfolio is managed by an expert who has years of experience in the stock market and its industries. Thirdly, people don't have time to track everything in the market, so they should opt for this option for a handsome return over a long time. Why it is better than Traditional investment options? 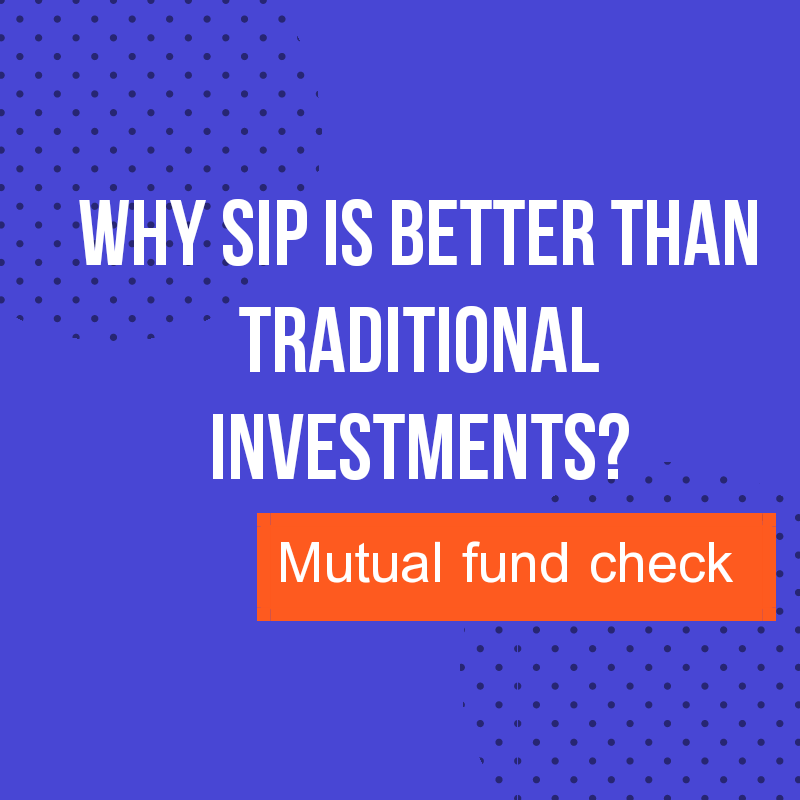 Honestly speaking SIP is better than any traditional plan because of its ability to offer a higher return in comparison to traditional investments. Let's take an example of Axis Long Term Fund which is equity linked saving scheme. If you had invested 5000 per month from Feb 2013 to December 2018 then this would be the calculation. Now let's check the return of a midcap fund. We will take the example of L&T Midcap Fund(Growth). If you had invested 5000 per month from Feb 2013 to December 2018 then this would be the calculation. So you can easily see that if you're investing in mutual fund through SIP then you can expect a return between 12-22% depending upon the fund and its performance. Even if you invest in index fund then also you can expect at least a 10% return which is better than any traditional investments plans. SBI, the largest PSU bank of India is giving interest at the rate between 6%-7% for both fixed deposits, term deposits, and recurring deposits whereas in post office you will get interested at the rate of 7%-8%. If you are investing in NSC then you will get 8% interest per annum. Each employee invests in provident fund regularly. It is giving 8.55% interest which is best in traditional investment category but still less than mutual funds return. That's why it is advisable to invest in mutual funds through SIP mode for a longer period to get the maximum benefit. The difference of 1% seems to be very less but if we take a bigger corpus then it really matters. If we had invested 1 crore rupees then 1% of 1 crore will amount 1lakh which is a significant amount for a middle-class family in a country like India. Please, it's a humble request to all of you to increase your time horizon. If you truly want to get maximum benefit then make sure you have set a target for 20-25 years. Why I'm saying this, because the famous quote of the mutual fund, "Mutual funds are subjected to market risks, read all scheme related document carefully." When it comes to market risk you can't escape from this. If your time horizon is 5-10 years then it may possible that the market will stay sideways and you won't get the return as you expect. But when your time horizon is longer then the market will definitely reward you with a handsome return. Take the example of investment guru Warren Buffet. He doesn't sell once he buys. I really like his concept of investing. So the major take away from this discussion is, "Invest for at least 20-25 years and you won't regret your rest of the life." So this was today's discussion. if you've any doubt then you can write in the comment box. Same applied in case of suggestions.